Vivekananda Kendra, Kanyakumari organized 160th Free Eye Camp on 02-07-2014 Wednesday from 9.00 a.m. to 3.00 p.m. in Vivekanandapuram Campus. Lighted the lamp : Shri M. Muthuswami, Senior Division Manager, M/s. United India Insurance Co. Ltd., Nagercoil, Shri Melvin Paul, Administrative Officer, M/s. United India Insurance Co. Ltd., Nagercoil. Dr. Prashant & Dr. Aditya, Shri S. Mahesh, Co-ordinator and 15 members medical team from Aravind Eye Hospital, Tirunelveli conducted the camp. Out Patients = 207. Sent to Tirunelveli for Operation = 41. Smt. Leela, V.K.R.D.P. District Co-ordinator welcomed the public and introduced the medical team and the sponsors. Shri M. Muthuswami, Senior Division Manager, M/s. United India Insurance Co. Ltd., Nagercoil, told that they are happy to sponsor such programmes as a part of their company’s social commitment. He informed that while doing business in insurance, they help the public through such kind of social service activities also. 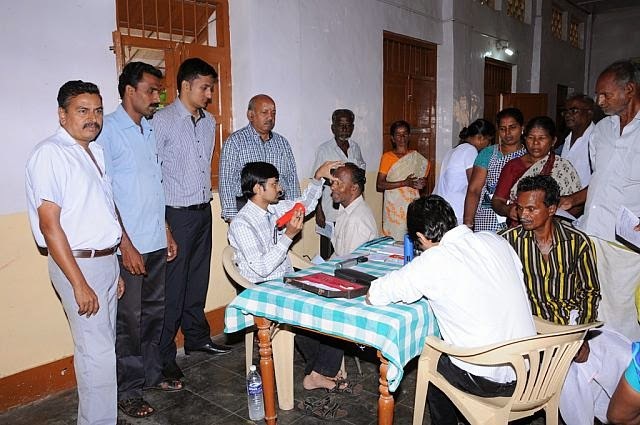 37 patients were given post-operative medicine and 10 people were given spectacles freely. Aravind Eye Hospital, Tirunelveli informed the Joint Director of Health Service and District Blindness Control Society, Nagercoil. Vivekananda Kendra, Kanyakumari had also sent the camp notice to them. Sri S. Mahesh, Organiser, Aravind Eye Hospital, Shri Anbuvizhi Sukumaran and Shri Babu, Kottaram co-ordinated the camp. Labels: 160TH FREE EYE CAMP AT KANYAKUMARI, Nagercoil, United India Insurance Co. Ltd.